A father and daughter from a US church which preaches hatred of homosexuals have been banned from entering the UK. 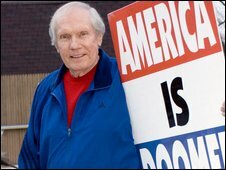 Fred Phelps and his daughter Shirley Phelps-Roper from the Westboro Baptist Church (WBC) had urged protests against a play being put on in Hampshire. Mrs Phelps-Roper told BBC News the decision would "bring great wrath upon your heads". She warned that other members of the church, who are not as well known to the authorities, would be trying to get into the UK to protest. "There are members of WBC that are not named Phelps," she said. "So they [the authorities] might have their work cut out for them. "Unless they intend to begin checking the bare backsides of every person coming into that country to find that tattoo that says 'Property of WBC', they will have no way of identifying who is from WBC." She called the British government "filthy" for thinking they had the power "to keep the word of God from coming into her borders". 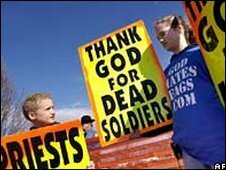 The Westboro church's website advertised the picket, which was set to take place on Friday, proclaiming: "In merry old England they plan to further enrage the living God by putting on the farce known commonly as The Laramie Project. Stephen Sheedy, principal at Queen Mary's College, said: "I have been amazed and disturbed by what has happened this week. "[The church's views] are such a gross abuse of Christianity and a gross misreading. "The show is being put on by a production company, not by our students, but we support it fully and hope it goes ahead without any problems." He did not expect any picket by the Westboro church but thought the coverage could actually spark a counter protest against them.